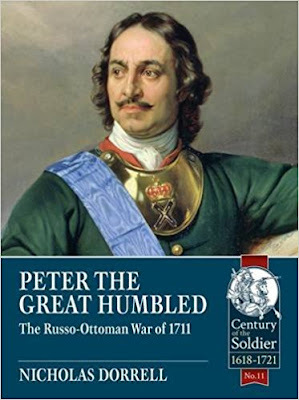 In 1711 Peter the Great, the Tsar of Russia, led a large army of veterans from Poltava and his other Great Northern War victories into the Balkans. He aimed to humble the Ottomans in the same way he had the Swedes a few years before. Victory would secure useful allies in the Balkans, cement Russia’s ‘Great Power’ status and offer Peter the opportunity to finally gain control over the Swedish king, Charles XII, thus completing his victory over Sweden. Yet within a few months, the ‘backward’ Ottomans had forced the Tsar and his Tsarina and their army of veterans into a humbling surrender near the Pruth River. The war was the first time that Russia was strong enough to confront the Ottomans independently rather than as a member of an alliance. It marked an important stage in Russia’s development. However, it also showed the significant military strength of the Ottoman Empire and the limitations of Peter the Great’s achievements. The war was of significance to the allies of both the Russians and the Ottomans. It was of course of an even greater importance to all those directly affected by the war such as the Swedish, the Polish, and the Cossacks, who had taken refuge from the reverses of the Great Northern War in the Ottoman territory. It would also bring about the defeat of the Moldavian and Walachian ambitions to shake off the Ottoman overlordship, elevating Dimitrie Cantemir into the position of a national hero celebrated to this day by the people of Romania. The book looks at the causes of this little known war and its course. Using contemporary and modern sources it examines in detail the forces involved in the conflict, seeking to determine their size, actual composition, and tactics, offering the first realistic determination on the subject in English.